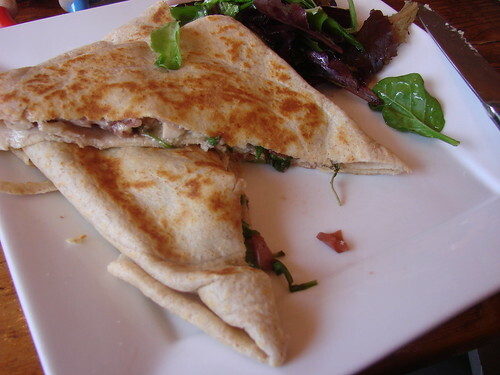 The Localvore’s Dream (above) a 100% local crêpe filled with Misty Knoll chicken, house-made cranberry-apple chutney, Boucher Farm Gore-Dawn-Zola and organic arugula on a Gleason's whole wheat crêpe ($12.95) was my favorite. I generally don't love arugula, but here it gave the crêpe just the right amount of bite to tie the whole thing together. The Lamb Fetatastic ($9.95) was also quite good. 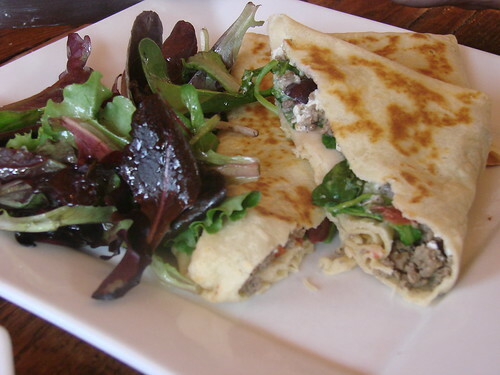 Made with Winding Brook Farm lamb sausage, baby spinach, cherry tomatoes, Kalamata olives, sautéed mushrooms and feta cheese, it was hearty and filling. 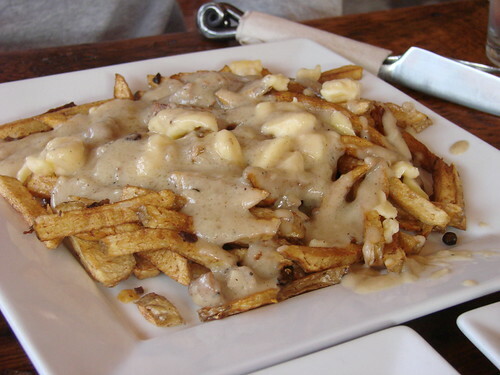 The poutine with bacon gravy was surprisingly not my favorite part of my meal. Bacon plus gravy plus cheese over French fries--how could that not be a WIN? It was fine and I suppose I hold all poutine to the Duck Fat gold star standard, hard for anyone to achieve. Next time I hit Montpelier, I'm going for dessert here. The Hot Apple Crispy--tart VT apples, pure VT honey, cinnamon sugar, and VT whipped cream sounds fantastic! Yay Skinny Pancake! The Love Maker (Nutella and fresh strawberries) is wonderful. Next time you're here, try kismet on Main Street for brunch. Huevos Rancheros changes daily and is always delicious. @AJ: Ooooh, thanks for the tip. Love Huevos Rancheros. Montpelier is a fun town. Hope to return for a visit in the summer.